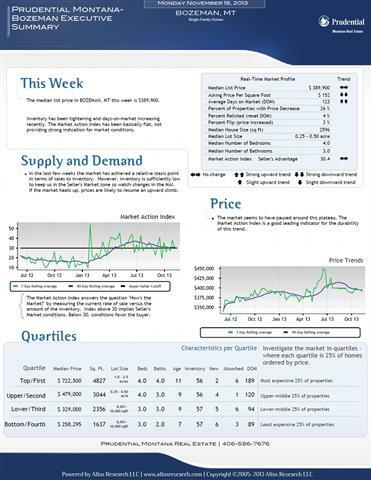 Bozeman Real Estate Report Market Updates indicates inventory has been tightening and days-on-market increasing recently. The Market Action Index has been basically flat, not providing strong indication for market conditions. Bozeman's home market continues at a stasis point regarding sales to inventory, as more Bozeman homes become available and consumer demand for houses declines.Bozeman home prices seem to continue to fall a bit. However, inventory is sufficiently low to keep us in the Seller's Market zone so watch changes in the MAI. If the market heats up, prices are likely to resume an upward climb. As noted in previous weeks, this portion of our southwest Montana Real Estate market has been on a downward trend and this week, while again remaining flat, doesn't break us out of that cycle.